Show Racism the Red Card’s annual Fortnight of Action (12 - 31 October 2012) has kicked-off and to mark all of the anti-racism / anti-sectarianism initiatives and events taking place Scotland wide, Show Racism the Red Card hosted a charity football match at Toryglen Regional Football Centre in Glasgow. The football match involved Ex-Professional Footballers, Politicians and representatives from the Scottish Media. The Fortnight of Action in Scotland makes a stand against racism and sectarianism. There is a pressing need at this time to stress both the anti-sectarianism and anti-racism message, given that recent incidents have once again highlighted the problem of sectarianism within our communities. Show Racism the Red Card is a partner of the Football Against Racism in Europe (FARE) network and the Fortnight of Action is Scotland’s contribution to the 13th annual FARE Week of Action against racism and discrimination, taking place Europe-wide. Ex-Professional Footballers pulling on their boots to support Show Racism the Red Card’s Fortnight of Action include: Gary MacKay, Steven Bell, Gerry McCabe, Chic Charnley and Gus McPherson, to name a few. 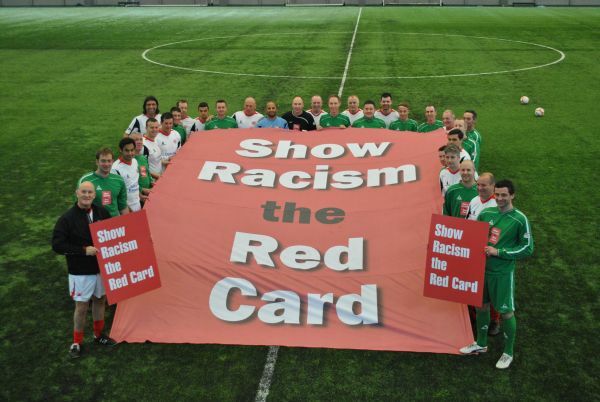 “Show Racism the Red Card has received magnificent support from the Scottish Government, trade unions, football clubs, football authorities and football fans across the country in supporting its fundamental message of equality and respect. We are confident that the impact of this year’s action taken at football grounds over the Fortnight of Action will be the strongest ever. “The profile raised through action taken at all professional Scottish Football Clubs will complement the great work which many innovative community groups across Scotland are able to achieve in promoting inclusion and fostering good relations between groups through our annual Fortnight of Action grants scheme. These grants of up to £300 support the development of community based projects involving community groups, schools, youth clubs, fans associations, tenants associations and grassroots football clubs to engage with young people, ethnic minorities, excluded groups, football fans and refugees and asylum seekers.